As always, its way to big at the top, and small at the waist. 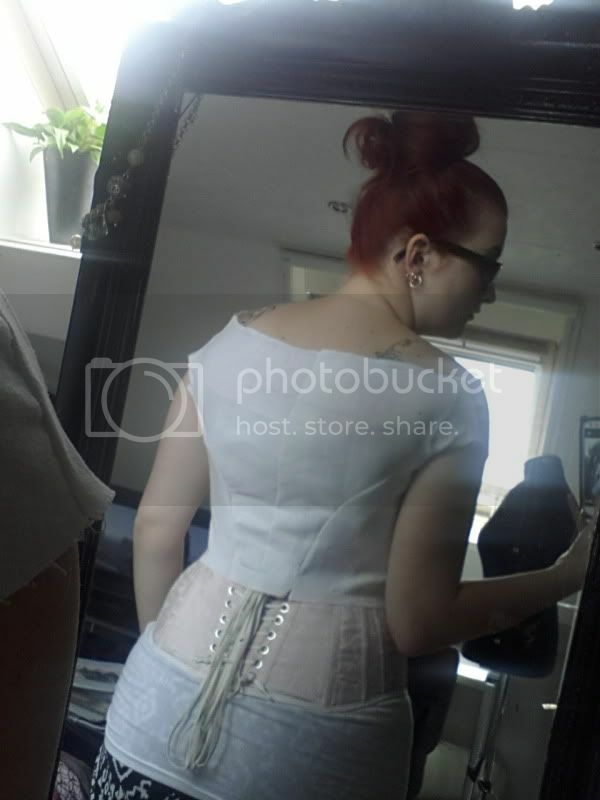 But at the back, at my waistt, it looks to big. I already made bigger darts. Moving my arms is hard, but maybe thats because the sleeves are low? Is it suppose to look like this? What i am seeing looks pretty good. Just a couple tweeks and you should be fine. First thing I see is that you have quite a lot pinned out at the center front. This pattern should close at the back, so there should only be 1/2" pinned out at the front for the seam. And the seam at the center back be sewn so that the center back overlap is removed. (I just read the instructions again, and this in not properly discussed. I will need to fix that.) If you match the back pieces at the side edges, with the center back edges offset like it is drawn on the pattern, then the center back seam should be sewn 1/2" in from the short center back edge. Assuming that you have the back sewn correctly, and based on the amount of extra fabric you have at the front, you may need a smaller front piece. 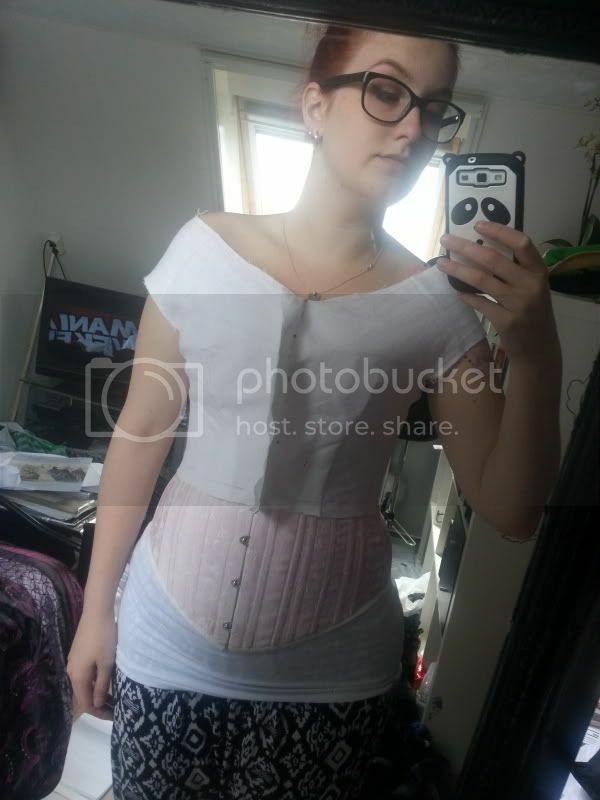 The second issue is that the bodice is way to long on you. It should end at the waist, with only the seam allowance 1/2" falling below your waistline. For your fitting, just fold up the extra fabric at the waist and mark where that fold line is. Then cut off the bottom, being sure to add 1/2" below the fold line for your seam allowance. 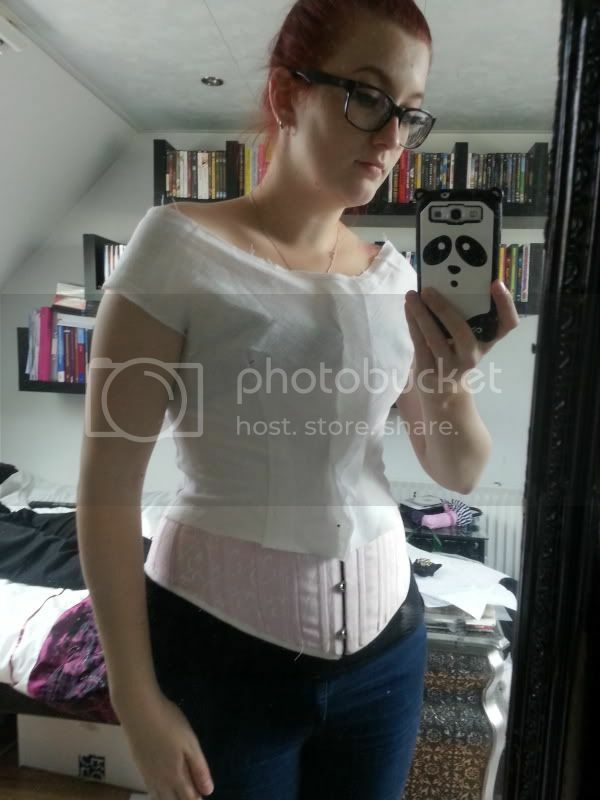 Once this extra fabric over the hips is gone, you will be able to fit the waist area with the darts. 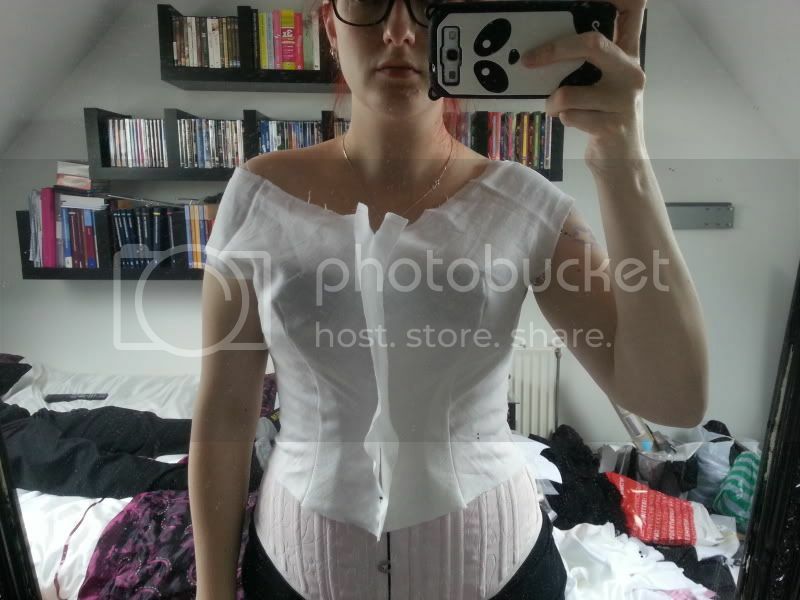 Right now, the fabric is pulling against your hips and distorting the fit. I wish I could see the back. The front does seem rather large on you, so I would be interested to see if selecting a larger back, and a smaller front would help. Especially, once you only have 1/2" pinned out at the front. The armhole will be way too far back for you. Thank you for your reply heather! Wow, that looks so much better! And really, for the 1830's, a tad short at the waist is just fine. Better to be a bit short than a bit long even. so I think where you have it now is just fine for a with seam allowance length. When you say the back is loose, where do you mean? The neckline, or the body? It is always harder to see things in a picture, but I really like how the back looks. At this stage, you want your mockup to be smooth, but not really tight. The dress itself has many layers of fabric that add bulk and the dress itself will usually come out smaller than your mockup. 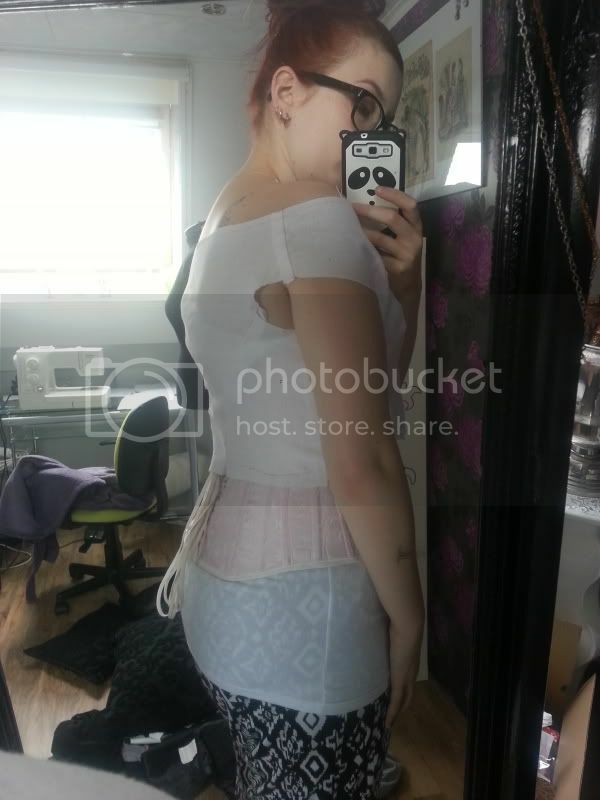 When you are standing normally in the back view, the armhole looks perfect. When you round your shoulder forwards in the side view, yes, you do get a gap, but that is normal. Clothing is supposed to fit when you stand properly and when you move funny, it won't move with you. If you are worried about the neckline, I think you are ok. The muslin will stretch more than you dress, and if you use piping in your neckline, you can "shrink" the neckline a bit when you put it on. If you need help with than later, let me know. I think the front looks great, too. The only thing I can see that needs fixing is the front of the armhole. I can see where the fabric is tearing as you move. Cut the armhole forwards more, until the edge of the fabric lays smoothly over your arm. Do not cut lower, just more forwards, into where the tears are. This will help you move a bit more, and keep it from binding. At the shoulder seam, if you want more motion, then you can change the angle of the seam so the strap is tighter at the shoulder, and looser at the armhole. And since you have huge sleeves to sew into the armhole, a larger armhole can be helpful. To fit the back, take in the darts at the front. That will pull the back in towards your body more. 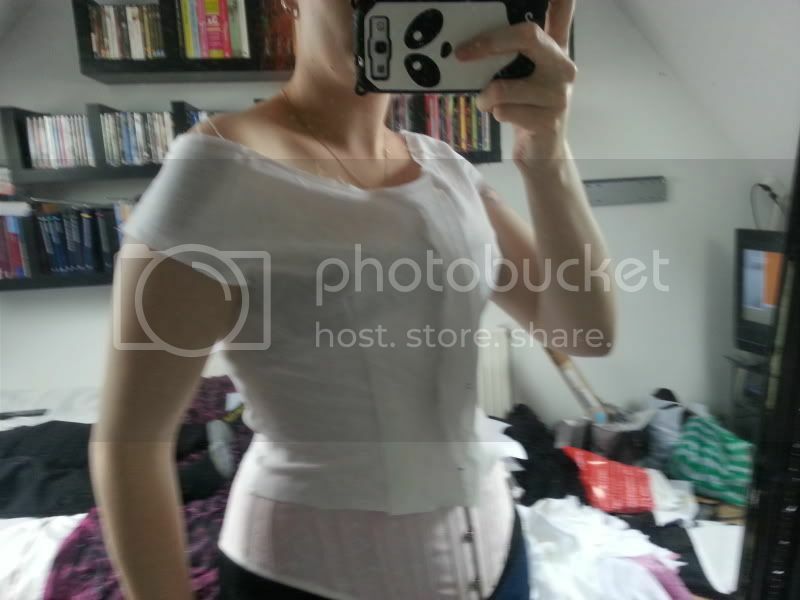 Or, you can take in the side seams more towards the waist. Or do a little of both. Just do not change the curved side back seam. I think you have the front fine, by taking out the extra at the center front. No reason to start over, after having got this far. Just keep it in mind for next time to start with a smaller size for the front.